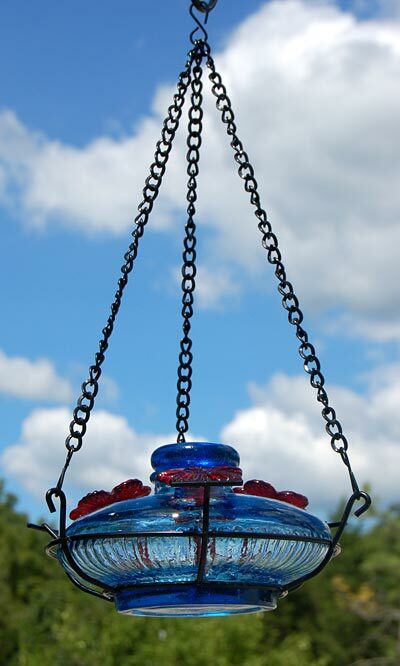 Wild Birds > Bird Feeders > Hummingbird Feeders > Blown Glass, Large, >16oz. Parasol Bloom Hummingbird Feeder with Perch, Aqua, 16 oz. Supply hummingbirds with an elegant dining and resting spot by placing this Parasol Aqua Bloom Hummingbird Feeder with Perch in your backyard. This dazzling unit blends delicate glass with hardy metal, for both you and your hummingbirds' delight. Raised and depressed vertical lines along the base of the blown glass vessel create a ruffled effect on it, and its light aqua hue evokes a pond. Rest this vessel inside the included, black frame, aligning the three perches on the frame with the ports on the feeder. The reservoir holds 16 ounces of nectar, and a red, blown glass flower inserts into each port for a recognizable feeding spot. Lift the striking, decanter style cap off the top of the vessel to refill it, and remove the entire unit from the frame for cleaning. An attached chain on the frame and included S hook make it simple to hang the feeder, while the aqua tone of it contrasts the black finish on the metal frame. Adorn your garden with delicate style using this Aqua Bloom Hummingbird Feeder with Perch.